Tara's excitement at visiting Doraemon town is probably best summed up by her reply when Seth asked her if she wanted anything to drink. She said "No, I'm so excited that if I drink something, I might throw up." 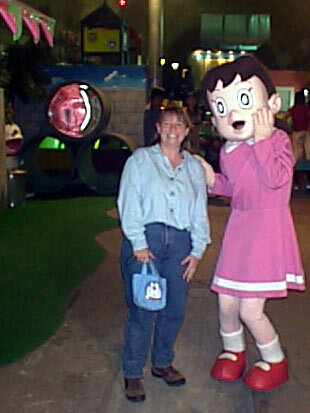 Obviously, Tara enjoyed Doraemon Town as much as any other 3 or 4 year old child! We ended up riding the Doraemon train because Seth saw an ad for this train right after we landed at Narita. After much translating, Tara figured out that the train left from the Northernmost town in Honshu and traveled under the sea to a town in Hokkaido. 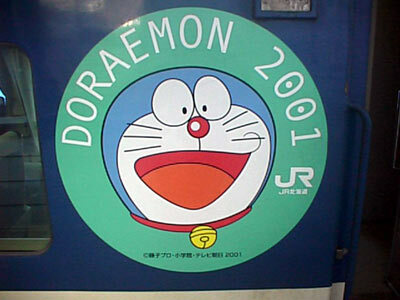 She also concluded that there was a Doraemon town under the sea since the name of the station translated to "Under Sea Station". There was no doubt in our mind about where we'd be traveling to at some point during our three weeks in Japan! In the end, we decided to head North toward the Doraemon train first. This made Tara very happy. We decided to break the seven hours journey from Tokyo to Aomori up across two days. Therefore, after a night in Sendai and the day in Matsushima, we arrived into the Aomori train station in the evening. The first thing we did was hunt for the Doraemon train in the station. We found it! Obviously, Tara was VERY excited! 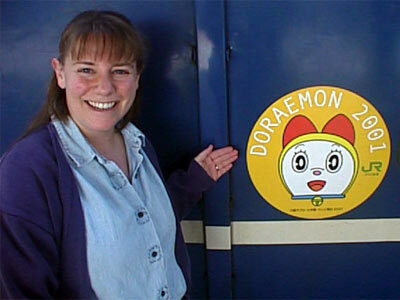 Here, in person, was the train she'd been seeing in the Doraemon train ad. We did have some problems finding a place to sleep - either because we were backpackers or foreign - various places were "full" when they didn't look it. In the end, we settled for a less than luxurious business hotel. Seth was a bit concerned about the police wanted posters posted in the lobby, but Tara's Mom said that at least you know there are no criminals in the hotel. 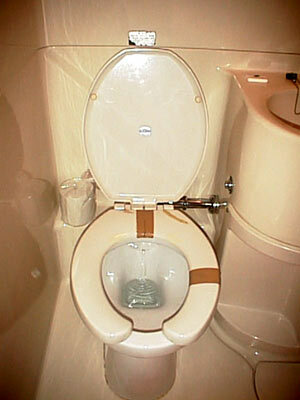 And it was clean, even the duck tape on the toilet seat looked clean. This business hotel had all the familiar features of the Yaesu Terminal Hotel near the Tokyo train station where we'd stayed in 1997: coin-operated TV, door frames too short for Seth and totally plasticized/trailer home-ish bathroom. A real letdown after last nights gorgeous ryokan in Sendai. Even with the semi-scary accomodation, we enjoyed a nice dinner at a nearby restaurant and settled in for a good night's sleep. 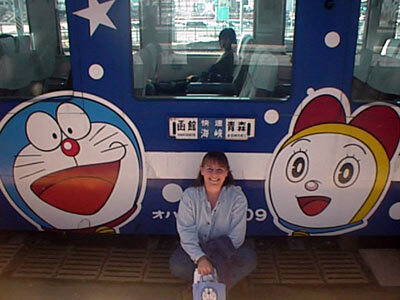 There was NO WAY that Tara was going to miss the departure of the Doraemon train the next morning. 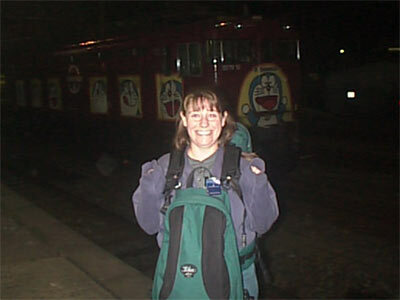 We were at the train station very early and had plenty of opportunities to take photos. 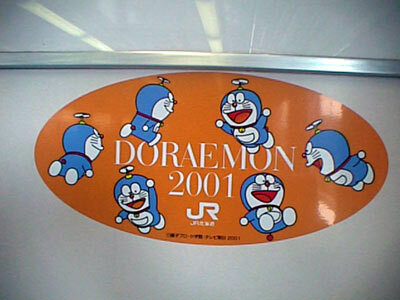 The whole train, inside and out, was decorated with cute Doraemon stickers. We also got to play one of our favorite "games" that we played often while living in Tokyo - the "which two of these things are different" game. It was immediately apparent to us that not only were we the only non-Japanese on the train, we were also the only non-parents on the train! The train ride to the Doraemon Under Sea station was fun and scenic in places. At one point we were traveling right along the coast and at another, we were amazed at the amount of snow still covering the landscape. We were in the far North. Tara was slightly concerned that we wouldn't know when to get off the train , but Seth was not worried, he knew that all we'd need to do is follow all the other children on the train! Tara got very, very, very excited when the train finally went into a tunnel that lasted long enough for her to be sure it was the under sea tunnel. Doraemon coming onto the train speakers and talking to us also gave us a clue that we were near. We were in for quite a shock when the train did stop and everyone got off. We were not at a train station as you'd normally use the word.We were being let off into an emergency access tunnell off the main tracks. It was odd. The train just stopped on the tracks, a conductor beckoned everyone off and then we were walking in a group of Japanese people and their kids through the middle of emergency tunnels. Of course, we couldn't clearly understand everything that was being said. Tara was understanding some of the words and phrases, but she was at about 60% comprehension level - so that did us really no good. We basically just followed everyone else along. We at least knew we were in the right place since the emergency tunnel was lined with Doraemon banners and a golf cart carrying two of Doraemon's friends popped out of a side tunnel and started leading the way. It was neat, but weird, since we kept walking and walking and walking. Every once in a while, a train employee would come zipping along on a bicycle. And the tunnels were decorated with tiles that hand prints or photos on them. Weird. but fun. 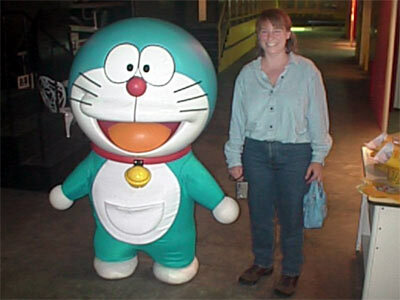 Everyonce in a while there would be a photo op for Tara since plastic Doraemon figures were placed at various points inside the tunnel. Finally, we arrived at the neon gate that signaled the entry to Doraemon Town! A running, smiling, very happy young Japanese woman welcomed us to the town and we were all free to roam around. Needless to say, Doraemon Town was built for the average 3 year old and Tara loved it!! 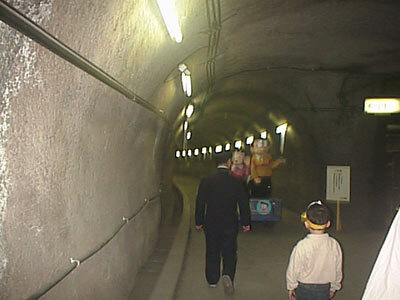 Doreamon Town was also inside of an emergency access tunnel. 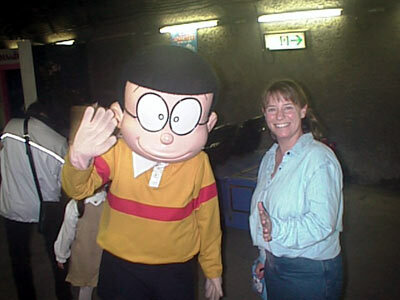 Doraemon's tunnel was slightly wider and taller than the tunnels we'd been walking through so far. His tunnel also had a small aquarium at the entrance showing fish that lived in the water surrounding the tunnel. Very kool! We headed immediately for all the small displays that Tara had seen in the Doraemon Train advertisement: Shizuka chan's garden, Giant's store, Nobita kun's house and bedroom. It was so much fun to see life sized Doraemon TV show characters (and these were only the plastic characters - the costumed characters had not materialized yet. Costumed Nobita kun and Shizuka chan appeared first. Just like Disney characters, they didn't talk, but mimed fun-things and posed for photos with you. We were exploring the inside of the "jump into the ball pit" play area when all of a sudden Seth said, very forcibly "Tara, come here!" Who did we see but Doraemon - waddling up the center of his town!! Seeing a waddling Doreamon was definitely the high-point of the whole day for Tara. She was very eager to meet him, but she did wait her turn behind the other 3 year olds. He waddled so cutely. Left, right, left, right, left right. He'd take little tiny steps and his whole body (plus tail) would sway from side to side. Overall Experience 9 Tara couldn't have asked for a more exciting and fun day! Accommodation 3 The hotel we stayed at suffered in our rating system since it had duck taped together toilet seat and the wanted posters taped in the Lobby. Other than that, it was fine. Tara's Mom told us to look at the bright side, at least we knew there were no wanted criminals staying in our hotel!